(Nanowerk News) Bloodhounds are famous for their ability to track scents over great distances. Now researchers have developed a modern-day bloodhound - a robot that can rapidly detect odors from sources on the ground, such as footprints. The robot, reported in ACS Sensors ("A Robot Equipped with a High-Speed LSPR Gas Sensor Module for Collecting Spatial Odor Information from On-Ground Invisible Odor Sources"), could even read a message written on the ground using odors as a barcode. Over the past two decades, researchers have tried to develop robots that rival the olfactory system of bloodhounds. However, most robots can only detect airborne odors, or they are painstakingly slow at performing analyses. Zhongyuan Yang, Fumihiro Sassa and Kenshi Haysashi wanted to develop a robot with a high-speed gas sensor that could rapidly track invisible odor sources on the ground. 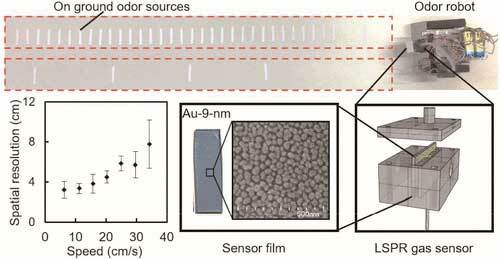 The researchers based their odor sensor on a technique called localized surface plasmon resonance (LSPR) that measured changes in light absorption by gold nanoparticles upon exposure to a gas. As the robot traveled across a surface, a tube placed close to the ground suctioned odors into the LSPR sensor. The researchers showed that the sensor could accurately detect the location of ethanol odor sources placed at different positions along the robot's path, at a travel speed of 10 centimeters/second (about 4 inches/second). In addition, the robot could read the word "ODOR" in binary barcode deposited on the ground as a series of ethanol marks at different positions. The robot has great potential in a multi-robot communication system or as a security robot working in an office, the researchers say.